There are lots of cookery books out there – my own bookshelves are a testament to this – so when it comes to a new one, I’m always on the lookout for something a bit different. And Spice Health Heroes is just that. It combines the culinary and medicinal in an extended love letter to a range of delicious spices. Spice Health Heroes is the work of Natasha MacAller, an ex-ballerina turned chef. It is based on her passion for spices, and the health and wellbeing (and taste) benefits they provide. She has created her own recipes which sit alongside a selection of aromatic dishes from internationally renowned chefs. However Spices Health Heroes goes much further than just cooking with spices. Natasha explores the culinary, nutritional and medicinal uses of more than 30 spices, from everyday citrus zest to the more unusual hibiscus. The spices are grouped into sections highlighting their dominant enlivening characteristics, whether it be immune and cleansing spices or restorative and calming spices. Each section focuses on a specific set of spices, setting out their taste and health profile. The book has been very well researched and will definitely appeal to any food geekery you might have (which I definitely do). It’s also peppered (no pun intended) with quotes from a range of medical professionals. I’m always fascinated by how ancient knowledge and uses of ingredients are often now backed up by science. However, ultimately I’m most interested in how these ingredients make our food more delicious and add to their sensory experience. Natasha’s definition of a spice is the seed, berry, bark, root, rhizome (creeping rootstock), branch, leaf, aril (fleshing coating on some seed varieties e.g. pomegranate) or sap of a plant. So that covers quite a lot! Normally I’d say something should be dried to fall into the classification of spice versus herb, but Natasha does use some interchangeably which makes for tastier dishes. Not surprisingly, a few of my favourite spices feature in Spice Health Heroes. Turmeric, which I often add to my porridge and use to make golden milk, is crowned the ‘master spice’. It has long been known in India for its curative properties, and recent studies highlight its antioxidant and anti-inflammatory benefits. Though you do need to be a bit careful as it also has great finger and clothes staining abilities. The California Girl Prawn Curry recipe incorporates a good pinch of the yellow stuff, alongside an aromatic mix of pepper, cardamom, coriander and cinnamon. This is just what you need on a cold autumn night. For extra zing, Natasha suggests turning to a range of energy spices: black peppercorn, coriander, cocoa, nutmeg and tamarind. And I of course fully endorse anything containing cocoa and will definitely be giving the Cocoa Nib, Seed and Cherry Bars a go. As an added bonus, you’ll find the recipe for Cocoa Butter Roasted Veggie Salad with Cocoa Nib Vinaigrette included below. 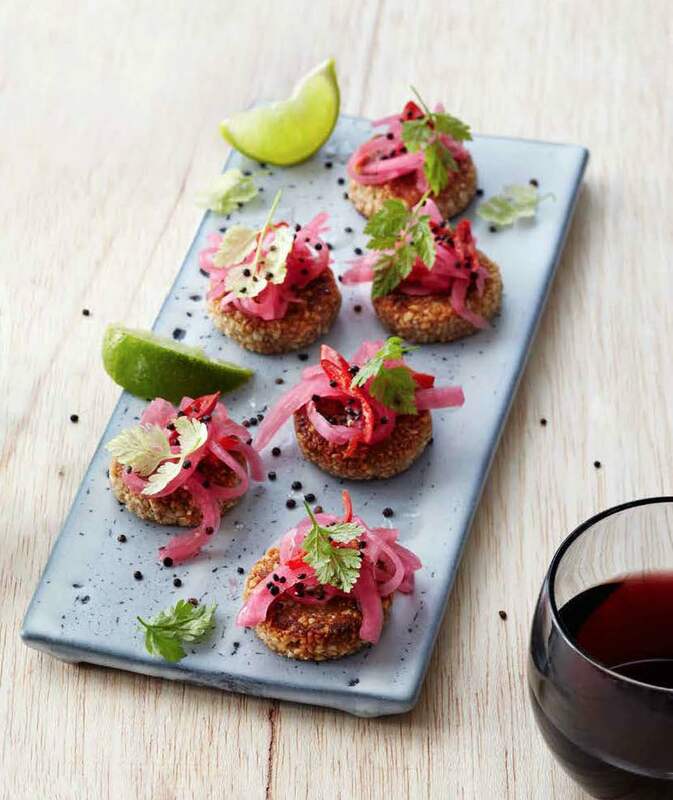 Spice Health Heroes contains some unexpected and surprising uses of spices, such as Fenugreek-Poached Pear with Dessert Dukkah (a blend including fenugreek, cinnamon, coriander and pecans), but the recipes are mostly very approachable. A few, like the Doves Bay Bouillabaise, are definitely more complex than others and I’d maybe keep these for weekend cooking. However many are completely suitable for mid-week meals. The recipes are also brought to life by the beautiful photography that accompanies them. This is a book of naturally healthy recipes, without needing to apply any ‘clean eating’ labels to it. 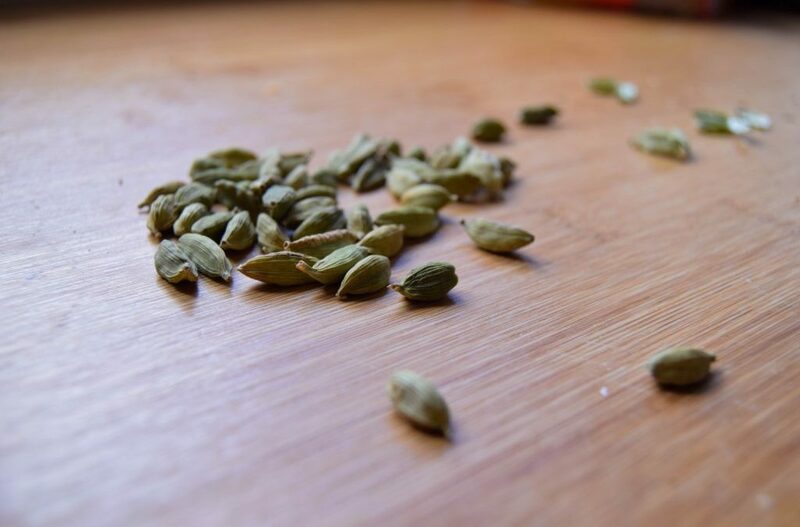 It incorporates whole foods and low levels of refined sugar in many of the sweet dishes, and is full to the brim with humour, flavour, and delicious spices. If you’re not sure about where to start with spices and are sometimes a bit scared about how to get them to work together, Spice Health Heroes should put you on the right path. ‘The first time I went to a cocoa farm in my native Panama I fell deeper in love with chocolate. It also made me feel responsible for the Native Indian communities who have abandoned cocoa farming because a fair price is not being met. Since then, we have been working with small growers to improve consistency and fair trade their cocoa beans, encouraging the new generation back into cocoa farming. Besides making our own chocolate from bean to bar with only two ingredients, cocoa nibs and raw sugar, we are constantly finding different ways to use it. Cocoa butter is a high stable fat with a long shelf life, rich in antioxidants. 1. Preheat the oven to 200C (400F/gas mark 6). Spread out all the vegetables on a foil-lined baking tray. 2. Put the fennel, coriander and cumin seeds in small pan and heat over medium heat for 2 minutes, shaking occasionally. Transfer to a spice grinder and grind to a coarse powder. 3. Add the melted cocoa butter, spice mixture and salt to the veggies and toss well to coat thoroughly. Roast in the oven for 45 minutes until the veggies are tender and caramelized. 4. Make the cocoa nib vinaigrette. In a small pan over medium–high heat, melt the cocoa butter, add the nibs and sizzle for 30–45 seconds. Add the olive oil, rice wine vinegar, sugar and salt and take off the heat. 5. 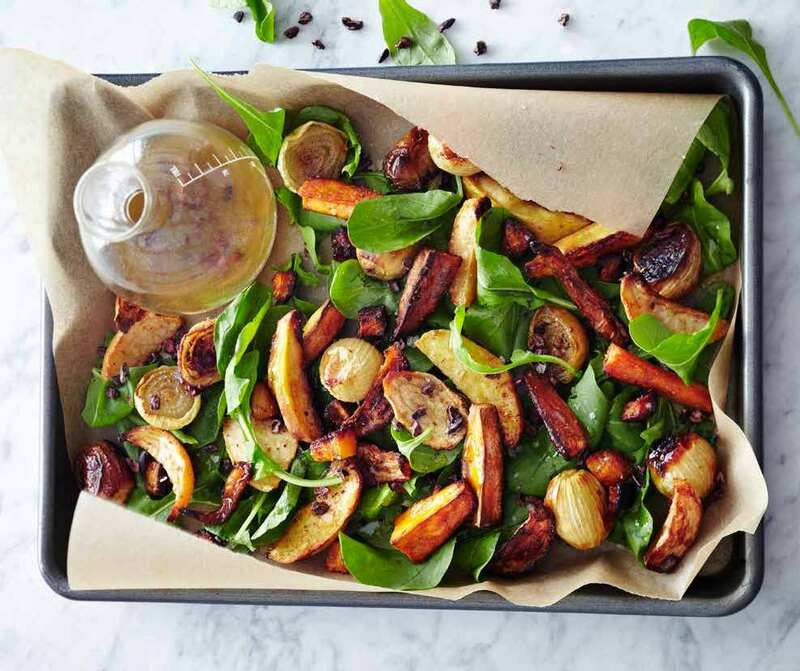 Serve the roast veggies on a bed of rocket, drizzled with the cocoa nib vinaigrette. What are your spice heroes and how do you like to include them in your cooking? If you’d like to explore more spices and warming flavours, check out my upcoming reflective cooking and tasting events. Thanks to Quarto Publishing Group UK for sending me a copy of Spice Health Heroes to review and providing the images included in the article. 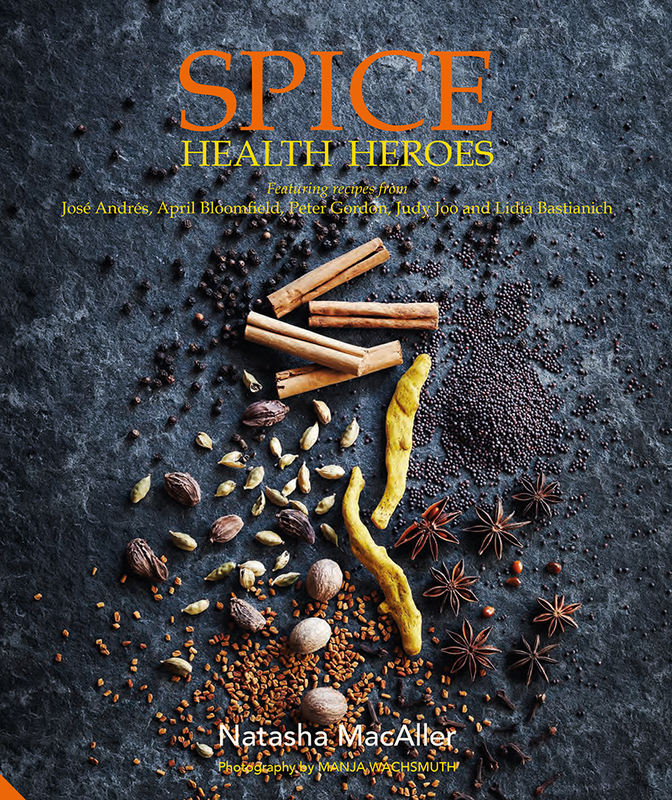 Spice Health Heroes by Natasha MacAller is published by Jacqui Small, with photography by Manja Wachsmuth.